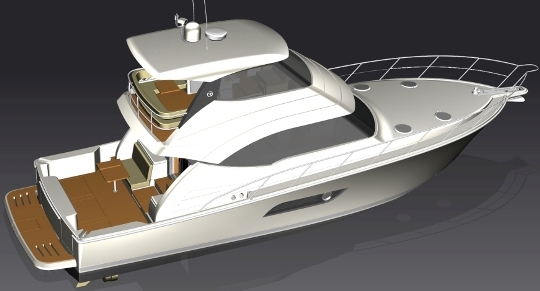 Riviera has just officially released details for an upcoming new 50 Enclosed Flybridge. This stunning new model is currently under construction and will make her world debut in 2013. The new 50 Enclosed Flybridge is expected to prove equally enticing as her big sister, the 53 Enclosed Flybridge. Powered by new generation fuel efficient twin Cummins with Zeus pod drives, or alternatively twin Volvo IPS with 700hp engines. Riviera’s new 50 Enclosed Flybridge is expected to top 32 knots, cruising between 25 and 28 knots and delivering a range of 400 nautical miles. Created in-house on Unigraphics 3D software, by Riviera’s team of designers and engineers, the focus is for absolute maximisation of design and space. The design team have retained the knwon for Riviera look while introducing some exciting new design aspects such as double side transom doors which allow better access from both the port and starboard sides, mezzanine seating with integrated table, enhanced cockpit storage with a self-draining moulded lazarette bin that has been integrated into the cockpit floor, tender storage on the boarding platform, increased side deck access, a large aft C-shaped lounge that runs the width of the flybridge, flexible accommodation plan, full head room in the two aft cabins, attractive enhancements to the exterior profile lines balancing the flybridge and saloon window, and huge hull windows with opening port holes on both sides giving the two aft cabins an abundance of natural light and fresh air. An additional 1.7 metres more of overall living space between the bow and stern has been made available through the incorporation of pod drives as compared to a similar sized shaft-driven boat. The new 50 Enclosed Flybridge features three luxuriously appointed staterooms and two bathrooms. A washer and dryer are concealed behind varnished cabinetry in the companionway. In a first for Riviera, there is the option to have the master stateroom forward or nidships on the port side. The saloon offers a huge U-shaped modern galley with polished Corian solid surface benchtops, European appliances and accoutrement's and ‘timber’ Amtico flooring. Forward of the galley is a U-Shaped dinette to port and plush L-shaped lounge to starboard with several ottomans allowing for extra seating around the dinette or can be pushed up against the settee to create a large chaise. An internal staircase adjacent to the galley leads up to the impressive flybridge which features a helm station forward on the port side with an adjacent L-shaped lounge allowing guests to easily converse with the skipper. A wet bar is located behind the helm chairs and aft in the flybridge is an enormous C-Shaped lounge that runs full beam of the flybridge, making it a great conversation and entertaining space not only when the boat is underway but also at anchor. The new 50 Enclosed Flybridge will make her world release in 2013 and Riviera has already taken orders off the plan for this new vessel.